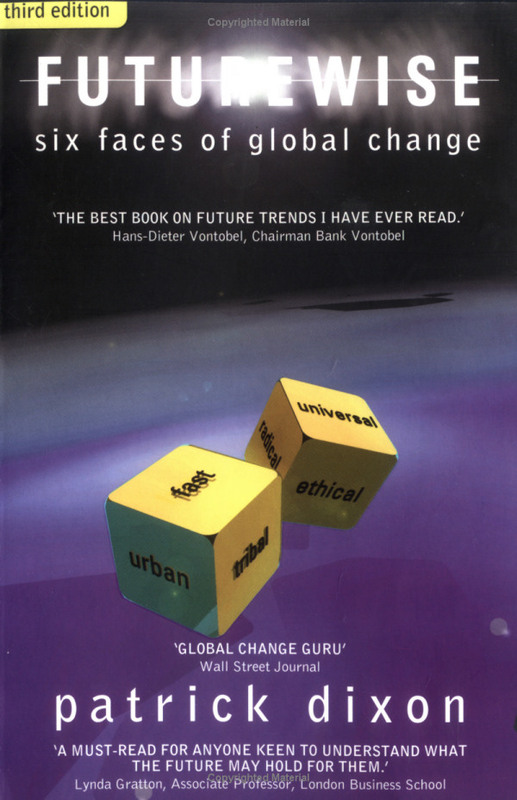 Six Faces of Global Change - Article published June 2003 but also applies to 2012. It’s easy to lose sight of the bigger picture in the rush to cut cost and conserve cash. Hopefully you succeed in protecting the business, satisfying shareholders and analysts, but what about morale and momentum in the senior team? To be a winner in the next three years you need to use the downturn to reshape for growth, propelled by an unshakeable conviction that your mission is still important, that more prosperous times lie ahead, and that in some way your company is helping to build a better kind of world. Your own passion for running the race matters most of all in a downturn when people are insecure and loyalty is tested. Your corporation’s future will be dominated by six factors, or faces of a cube, spelling F U T U R E. So if you are going to cut, then cut carefully for healthy fresh growth, and take the rest of the workforce with you with a renewed sense of direction. And what direction is that? The world is changing faster than boards can think, so survival means scenario planning as far as possible before events happen, with rapid response plans, making every dollar count. Market research can’t predict the future in a rapidly changing world – it just shows what consumers think. We need bifocal leadership: clear short-range thinking and sharp action now to steer through the downturn, as well as accurate board-level vision and steady nerves to see beyond. Look out for the next big wave of techno-change – we are still in the first day of the digital age, and many corporations are distracted by other pressures. Who’s watching your radar screen? Where does your board get fresh insights from? Who’s bringing external perspectives to protect you from institutional blindness? Who’s watching your own back? Big demographic and social “lifestyle” shifts will impact your business in this new decade, century and millennium: fickle fashions, ageing but wealthy populations, retired people inheriting trillions of dollars, aggressive war for top talent, female consumer influence, designer biotech life, human cloning, medical breakthroughs, virtual relationships and a host of other factors, including the huge untapped challenge of megacity markets in emerging economies. These society changes are fundamental to the future shape of your business, in many ways indirectly because they will alter how people think and feel. Soft factors may create your greatest new business opportunities. But are your teams gearing up to exploit them? The opposite of Tribal is Universal. Globalisation, the emergence of the global super-brand and huge pressures to manage global operations more effectively, using new technologies, emergence of virtual teams and companies. The future of Europe – growing soon to 25 nations – will be dominated by conflict between two equal and opposite forces: tribalism is causing many European countries to fragment, and universalism is welding these same fragile nations into one super-state. It is strange that countries are rushing into total one-ness at the same time as neighbours kill each other for speaking with the wrong accent or language. Low-grade ethnic cleansing by intimidation and violence is a daily reality in Europe – not only in bits of former Yugoslavia but also in the UK (Northern Ireland) and elsewhere. Tread carefully in pan-European business deals. It may all look Euro-ised from the outside, but beneath may be pure tribalism. Globalisation will dominate the shape of all large corporations as competitors realign through rapid mergers, acquisitions, disposals or new partnerships. However reactions to globalisation will grow and require careful handling. Powerful global structures will emerge and affect your international interests. Are you being radical enough in globalising your management style and structures? Few of your workforce or clients are likely to be active members of political parties, compared to the vast numbers who have signed petitions or campaigned for causes. With the death of left / right politics and weakening of “big” government power, corporations are increasingly vulnerable to attack by single issue groups. Examples include the war against terrorism, animal welfare, and child labor in the textiles industry. As Swiss banks found with Nazi gold, Shell found with oil rig dumping, Nestle found with baby milk products, Nike with factories in emerging nations, and MacDonalds with beef-contaminated French-fry oil in India, these issues strike hard and their impact can be hard to predict. Clear policies, strong values and rapid media response teams are vital. Are you monitoring this area sufficiently? The heart of America has always been stirred by more than money, but even more so today. For example 60% of adults and teenagers give time to causes they believe in – an average of 200 hours a year each, equivalent in value to 4.5% of GDP or 12% of the Fed budget. We’ve seen a huge increase in a decade and one that preceded September 11. You’ll learn more in five minutes asking a colleague what organisations or causes they give time to, than in five months sharing an office coffee machine. Retaining and motivating top executives will mean far more than money in future. Personal work has already changed dramatically in the last five years and will continue to do so. It’s much deeper than work-life balance. The key to capturing people’s passion will be showing how your products and services build a better kind of world, not only for individual people and their families, but also for the community and for the whole of humanity. Then people will be proud to work for you, and to by your products and services. How do you measure up? The six faces form a cube but the cube is weighted. Most senior executives see the world mainly as Fast, Urban and Universal – but how many people in a nation need to be very Radical, Ethical and Tribal to change your world? Multinational CEOs and Chairmen usually tell me just 0.5-2%. And just one shareholder on a mission to change a corporation can be enough to keep a CEO awake at night before an AGM. You can’t keep all the faces in view at once so… keep turning the cube.